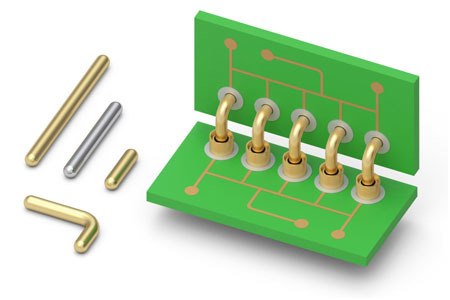 Mill-Max has developed additional straight and right angle male PCB pins to complement the existing 35XX and 37XX series. In addition to the .020” (0,51mm), .025”( 0,63mm), .030”( 0,76mm) and .040”( 1,02mm) diameters available, these new pins now offer diameters of .060”( 1,52mm ) and .080”(2,03mm). They are suitable for plugging into receptacles and/or soldering into printed circuit boards. The new .060” (1,52mm ) and .080”(2,03mm) diameter pins are a good fit for applications demanding high mechanical strength or to meet higher current requirements. The 37XX series is ideal for any situation where a right angle connection is required. They can be soldered on to a daughter card and plugged into receptacles or connectors on a motherboard for perpendicular board mating. They can also be combined with right angle receptacles or connectors to mate boards in parallel (daisy chaining). These brass pins are precision-machined and are closely monitored to produce pins with consistent bends each time. The tips of the pins have a full radius shape making them easy to plug into board holes or receptacles. The straight pins, series 35XX, come in three lengths, .250” (6,35mm), .500”( 12,7mm ) and .750”( 19,0mm) and are available in diameters of .060”( 1,52mm ) and .080”(2,03mm). The standard plating option is 10μ" gold over nickel. As always, other plating options are available upon request.